With your Skin for Life Microdermabrasion equipment (Nue Skin 50, 50 , 100, and 500 Microdermabrasion machines) or 10-in-1 Multi Functional System, you should have (1) hand piece with a black tube attachment; this tubing may be used for the additional Diamond Tip attachment if needed. Take one diamond tip that is appropriate for client’s skin type and condition. Insert a white circular filter inside the head of the tip. This is important when capturing the debris of dead skin cells. Screw diamond tip onto the tip of the hand piece. Make sure it is tight and secure. Insert your black tube into the vacuum fitting. Adjust the vacuum pressure to what is comfortable for your client with Spray/Vac Knob on the SFL 10 in 1 Multi Functional System or suction knob on our Nue Skin Microdermabrasion systems (Nue Skin 50, 50 , 100, and 500 Microdermabrasion machines). Follow the technique guidelines when performing diamond tip microdermabrasion; use even, smooth strokes. 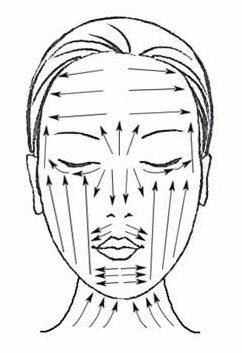 Please review diagram for microdermabrasion directional techniques below. Use a scrubbing tool like a “Tooth Brush” along with 99.9% antibacterial soap to scrub diamond tips. Be Thorough. Then use Sani-Cloth “Germicidal Disposable Cloth” as a secondary precaution. Be Thorough. You may use 99% Isopropyl Alcohol for additional sanitation. Insert diamond tips into a UV sanitizer for at least 10 minutes. D180 & D100 – Body, especially for acne, knee / elbow areas and striae of pregnancy. D220 & D180 for Face and for the larger blemishes. D250, D200, D100 for Scars, fine lines and imperfections. D250 & D200 – Eyes and both sides of nose, for wrinkles, oil tablets, blackheads and acne. Cotton filter starter pack – *White filters should be replaced after 5-6 customer treatments. Gives you the capability of crystal free microdermabrasion for exfoliation and removal of dead skin cells.